Women’s Studio Workshop’s Summer Art Institute is for artists of any gender looking to expand their visual vocabulary in printmaking, hand papermaking and book arts. Each summer up to 200 artists come for intensive weeklong workshops either at our Rosendale studios, or at hand picked international locations. 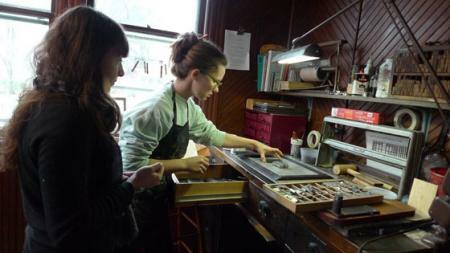 Located in New York’s mid-Hudson Valley, WSW is renowned internationally for its printmaking, book arts, and hand papermaking residency programs and is recognized as the largest publisher of handmade artists’ books in the U.S. Our 5,000 sq ft of studio space is fully equipped and studios are available for rental. Our letterpress studio is equipped to handle projects that include hand set lead or wood type, photopolymer plates, wood and linoleum block and die cut imagery.